SD-WAN as-a-Service: Bridging the "Application Performance Gap"
Many organizations struggle with the dichotomy of WAN infrastructure solutions. They want the centralized management, and reliable and agile application delivery SD-WAN provides. At the same time, they struggle with the time and costs associated with multiple carrier contract negotiations, link deployment, invoices and payments. And when maintenance problems arise, they must deal with different support organizations from each service provider NOC. 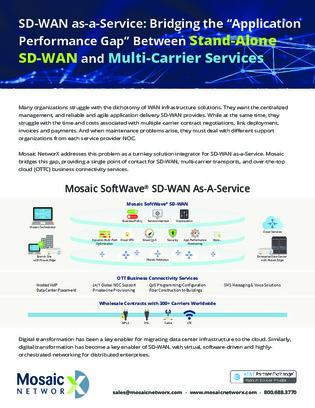 Download this white paper to learn how you can solve those problems with SD-WAN as-a-Service—which can provide a single point of contract for SD-WAN, multi-carrier transports and over-the-top cloud business connectivity services.